I have commented many times about the fact that people with dementia lose their rational thought processes. They gradually lose their memory of names, places, and procedures. On the other hand, they retain their intuitive abilities. They are able to enjoy music, beauty in nature and art, eating favorite foods, and socializing with friends and family. Kate and I have gotten along happily by focusing on her intuitive abilities and have minimized the importance of the rational ones that have diminished so greatly. Over time, I have begun to notice an interesting intersection of rational and intuitive thought and have been struck by this connection. Let me give you a few examples. At lunch earlier this week, Kate and I talked about a friend of mine. She asked where he lives. I told her Columbia, South Carolina. She was curious about the name and wondered about its origin. I told her it was named after Christopher Columbus. She said, “Who is he?” I explained that he is often thought of as the one who “discovered” America. She was puzzled. That led to my trying to explain his attempting to find the East by sailing west. I mentioned that people used to think the world was flat. As you might expect, she was quickly overwhelmed by information and asked me to stop. Her rational thought processes were unable to absorb what I was telling her. We had a similar experience another day this week. She said something funny. We both laughed. Then I said, “You can really be funny. I’ll be your straight man. We could put this show on the road.” I got a puzzled look. I could tell she didn’t know what I meant by “straight man.” Then I tried to explain it. I didn’t get very far at all. I told her about comedians who worked in pairs and that one would appear to be more serious and would say things to prompt the other person to respond with something funny. Then I foolishly mentioned Abbot and Costello, George Burns and Gracie Allen, and Dean Martin and Jerry Lewis. Naturally, she didn’t remember any of them. I told her we would look at some YouTube videos to help her understand. That diverted her attention, and we went on to something else. The important point is that she has an intuitive sense that leads her to want to know the answer to a question her rational thought can’t handle. The jigsaw puzzles she works on her iPad represent the most relevant example in our lives. She loves working her puzzles. She often asks me what she can do after we come home from lunch, dinner, or other outing. I give her the same choices almost every time. No matter what options I give her she almost always chooses the puzzles. Once she starts them, she inevitably runs into a problem. Every problem arises from a failure of her rational ability. One of the most frequent ones is getting stuck in the store to buy more puzzles. There is a small green button with a shopping cart in the upper right-hand corner of the screen. She frequently touches it instead of the button that will take her to select the next puzzle. Similarly, when she is on the screen with the choices for her next puzzle, she often forgets that all she has to do is touch the puzzle she wants to work. She often asks me how to get to the next puzzle. Other times, she chooses the “Store” button instead. This can be frustrating for her. She wants another puzzle, but she can’t remember how to get it. In other words, her intuitive thought exhibits a feeling of desire for a puzzle, but her rational ability doesn’t function well enough to do it consistently. Now let me return to my comment about an intersection of rational and intuitive thought or abilities. It has been almost a year since I first read The Dementia Handbook in which the author, Judy Cornish, defines these concepts and explains their relevance for people with dementia and their caregivers. When I first learned about these concepts, I thought of them as completely independent abilities unrelated to each other. I am now discovering that is not so. My error was failing to recognize an important intersection between the two. Our intuitive thought leads us to get the answers to questions or problems. That’s something every parent and school teacher observes on a daily basis. Very early infants and toddlers use their intuitive abilities to explore the world. Think about a young child who picks up an object, looks at it, puts it in his mouth, and/or bangs it against the floor. In each case, he is learning something about the world around him. The curiosity of children always intrigues me. Everything is new. They have very little in the way of rational abilities and want to learn about everything. Our rational abilities develop over a lifetime, and much of learning involves our intuitive thought that tells us this learning is important or interesting or both. Kate was an English teacher for three years and a librarian for the balance of her career. Like other educators, learning (and this means a lot of rational thought processes) is something she values highly. She admires and respects people who have achieved high levels of knowledge in any field of study. Even at this late stage of her Alzheimer’s, this feeling about knowledge is strong. She expresses it when she overhears a report on the evening news and wants me to explain it. The sad part is that she is no longer able to learn the way she did before. The surprising thing is that she isn’t frustrated all the time. Our son Kevin and his family are coming for a visit tomorrow. Kevin comes about three times a year, but this will be the first time the rest of his family has been here in five years. That and the fact that our lives could be very different the next time they are here makes this one special. Since I learned about their visit, I have periodically told Kate they would be with us. She is always happy to learn they are coming, but her memory doesn’t allow her to retain it. For the first time, I have been more mindful that dementia doesn’t just remove the past from one’s memory. It also prevents the joy of anticipating the future. I don’t think I am alone in failing to think about this loss. I’ve read a lot of books by caregivers and people with dementia. I’ve also been in touch with a large number of others via social media, especially Twitter and Facebook. I’ve heard many stories about forgetting people, important events, and the difficulty with conversation because it depends so much on memory. They all deal with the past. I don’t recall any that dealt with the loss of the future. Everyone derives pleasure from anticipation. The first thing that comes to my mind is my father’s excitement as he approached his 100th birthday. He started talking about it and making preparations as soon as his 99th birthday party was over. Our lives are filled with anticipation of things, big and small. – the birth of a child, a teenager’s getting a driver’s license, college graduations, weddings, reunions, vacations, anniversaries, weekends, starting a new job, moving to a new home, many different sources entertainment (concerts by a favorite singer or group, a popular Broadway play, the latest Star Wars movie), and visits with family and friends. Looking back, I can’t recall when Kate lost this ability. I know it’s been a long time. I regret that she hasn’t been able to experience the joy of knowing she will see her grandchildren tomorrow or other special moments like our being at Casa Bella for music nights. I am glad, however, that she is still able to experience things in the moment. Those have been very important to us. In fact, they have made the difference in how I feel about the way things are going. The ability to anticipate the future does not always bring pleasure. The only good thing about knowing Kate’s future, and that has been very important, is that it has caused us to make the very best of our time together. I am glad she is unable to anticipate or imagine what her life will be like in the days ahead. That’s something I don’t like to think about, but it’s hard to escape. I doubt that I am the only caregiver who frequently tries to teach something to his love one. One of the things caregivers are told is to accept the fact that people with dementia lose their rational abilities. That makes it difficult to remember names, facts, and procedures. That’s hard for caregivers to get that through our heads. Ultimately, I suspect that most of us do give up trying, but that can take a while. I think I am there now; however, there are some kind of situations in which I can’t resist. One of those involves Kate and her puzzles. She has been working jigsaw puzzles on her iPad as much as six to eight hours a day for several years. In the past few months she has begun to have trouble. Sometimes she forgets what to do after finishing one puzzle or to begin a new one. Sometimes she looks at the scattered puzzle pieces and can’t remember what to do with them. When this happens, she asks for my help. Occasionally, she wants me to put the pieces in place for her. Most often, she wants me to solve the problem for her. That usually means getting her out of the store to buy more puzzles or to bring up the next one. Sometimes she wants help completing a puzzle. When this happens, I find myself giving her instructions. For example, I suggest that she locate the pieces that go along each border. That is difficult for her. To help I tell her to look for the pieces that have flat sides. When I do this, I am trying to teach her. So far, I have had zero success. This makes me feel that she can’t learn, but I was wrong. Here’s how I discovered that. I’ve been putting drops in Kate’s eyes for the past three weeks. The first week or so Kate was frightened by my doing this. She frequently closed her eyes right before a drop went in her eye. After a successful drop, she usually said, “That wasn’t bad.” Other than those words, she had virtually no response to the actual drops. It was the anticipation that troubled her. I was beginning to dread giving her drops another few weeks when she stopped being afraid. Now when I tell her it’s time for her eye drops she isn’t afraid at all. She has obviously learned that it is nothing to be afraid of. This does not appear to be tapping into her rational thought processes but her intuitive ones. I say that because she almost always forgets that she takes drops. When I tell her it’s time for her drops, she either asks why or puts our her hand for me to place a pill in it. She still doesn’t remember that she has had the surgery, and I have told her almost every time I have given her drops. This confirms the fact that she can’t learn what requires rational thought or ability, but she can learn things that depend on her intuitive thought or ability. As I reflect a little more, I believe those who work with larger numbers of residents in skilled nursing and memory care facilities could tell many stories that illustrate this kind of learning. Having spent a good amount of time with my dad during his last 3 ½ years in a skilled nursing facility, I am well aware that there are many routines in places like that. There are regular eating times, times for activities, ice cream treats, and meds. Most residents fall into those routines quite easily. I hadn’t really thought much about this before. Recognizing it strengthens my belief in the value of music and photo albums for Kate. It makes me think even more about the power of our relationship. I am only now beginning to fully appreciate what we have created together. I’ll give an example of that in another post. Numbers have played an important role in my professional career in market research. The vast majority of the reports and presentations of research findings were filled with charts and tables containing lots of statistics. As a result, I have often yearned for a chart that would summarize our experiences since Kate’s diagnosis eight years ago. That would have been possible if I had kept statistical records along the way. During the early years after the diagnosis, I didn’t even think of doing that. As time progressed, I felt I didn’t have time to keep an accurate statistical record. I settled for what we researchers call a qualitative approach. I simply describe in words what our lives have been like. Most people can relate to that more easily anyway. The problem is that words don’t always convey the changes that occur over time. For example, I find that my early posts talked about how short her memory was. Some of my recent entries say essentially the same thing, and yet I know that her short-term memory is vastly shorter now that it was then. I do try to call attention to symptoms the first time they appear. I also try to give some approximate time indicators. For example, I often say that Kate’s sleeping pattern started changing during the spring of last year or the approximate number of months since the pattern started changing. For the most part, however, this blog consists almost entirely of my descriptions of our experiences. 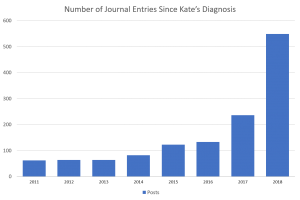 Having said this, I have discovered that launching the journal as a blog one year ago has provided statistical data. 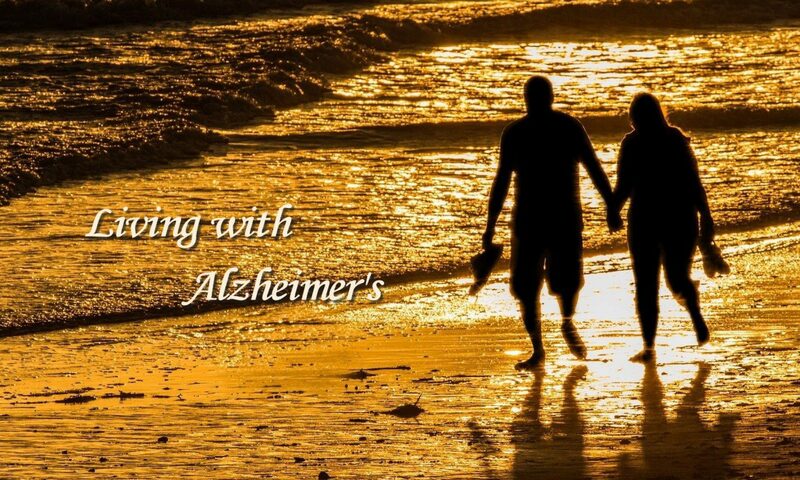 Only one of those gives me much information that relates to our experience with Alzheimer’s, and it is very limited. The WordPress software I use organizes all of the posts by year. I put that together in the chart below. It doesn’t begin to do justice to what has gone on the past eight years; however, it does show how the progression of Kate’s Alzheimer’s has affected my writing. During the first three years (2011, 2012, and 2013), our lives didn’t change much. I didn’t have as many things to write about. That began changing in the years 2014, 2015, and 2016. I remember that 2014 was the year I felt I should tell our children and close friends about Kate’s diagnosis. Early that same year, we went to New Zealand. I knew then that our traveling travelling days were numbered. It was becoming increasingly difficult to manage everything on long trips. We took our last overseas trip (Switzerland) in 2015. In 2016, I saw more signs of change. I believed that our annual trip to Chautauqua would be our last. Fortunately, we were able to make one more trip in 2017. That year I wrote 77% more posts than the preceding year. The big jump occurred last year. Our lives changed substantially as did the number of my posts. They were up 132% last year. Of course, that was the first year of my blog. I know I was more diligent in writing. Even with that, however, I have always tried to write when I had something I wanted to say (not necessarily what readers might want to hear <g>). In 2018, that happened more often. So, what is in store for 2019? The answer is I don’t know. As in previous years that will depend on what happens next. If I were to guess, I would say that the posts will level out for a while and, possibly, decline. Through the first 36 days of the current year I am averaging one and a third posts a day. I expect that Kate will sleep more, and we will be less active this year than last. That might mean fewer things for me to report. As with so many things, time will tell. Yesterday was a different kind of day. The past couple of days I’ve had wonderful connections with friends and family that go back to my college days at TCU. In one case it went back to the fourth grade. At this stage of life hearing from people you have known over a lifetime is especially precious; however, there were aspects of each of them that gave me something of a melancholy feeling yesterday. It began the day before when I tried to reach my childhood friend and neighbor and discovered she is in the last stages of dementia and unable to communicate with me. Then yesterday morning I received an email from one of Kate’s cousins. She had written a very touching poem as a tribute to her husband who was diagnosed with dementia and died in 2013. Yesterday was his birthday. It was a beautiful expression of her love for him. A little later in the morning, I read an email attachment from a college friend and widow of one of my college roommates who had dementia. It was a tender story of their lives together. My former roommate took up poetry in a serious way in his later years. She included a poem he had written to her on an anniversary in 1996. I am sure it meant a lot to her at the time and even more so now. After Kate and I returned from lunch, I was surprised to see a package on our front porch. It was from another TCU roommate. We had been out of touch until the past six to eight months. He sent some autobiographical writings that he had prepared for his children. He was an outstanding singer in college, and we had sung in two different choral groups together, but I hadn’t kept up with his career at all. I also learned that he had lost his wife to cancer. Reading about his experiences summoned up feelings I often have at memorial services. It’s a feeling of “knowing” people but not really knowing much about them. I am glad to have connected with him now but wish that I had been in touch with him before. Add Kate’s situation to this mix of connections. Her Alzheimer’s continues to take her in the only direction it can, and now she has a cold. My feelings for her are the same as those a parent has for a sick child. After lunch, we came back to the house where we spent the rest of the afternoon in our family room. Kate rested on the sofa while I went through the writings of my former roommate. As I reflected on my friends’ memories, I looked over at Kate. Despite her cold, she was lying there peacefully with few of her memories left and no sense of the future or just how precious our moments are right now. I felt sad for her. I don’t like to see her facing the symptoms of a cold much less those that accompany her Alzheimer’s. Like my friends who lost their spouses I am grateful for memories of the past, but, unlike them, Kate and I still have time to make new ones. They will be quickly lost for her, but I will remember. Today is a day that is hard for me to forget. It was eight years ago that Kate was diagnosed with Alzheimer’s. I just finished a quick look at the posts I made during the first ten days after that. (http://livingwithalzheimers.com/the-diagnosis-and-following-ten-days/) At that time we were experiencing all the emotions that surround such news. Kate was initially relieved but very quickly became scared and also angry. Fortunately, neither of the latter two emotions was long-lasting. Although we were not surprised with the doctor’s news, the reality shook us. We had to sort through those emotions and figure out how to move forward. At that time the future seemed very blurry. We were simply trying to grasp the diagnosis. We experienced a lot of feelings. We talked about the diagnosis and our future and tried to understand its implications. We couldn’t escape thinking about all the negatives that go along with the disease. One of the things that struck me was how quickly we went into planning mode. We have been there ever since. That’s not because our plans were wrong. It’s because the situation is always changing and requires answers to new questions or problems. Our initial plans focused on two general areas. First, we needed to address legal and financial issues. That meant meeting with our attorney, accountant, and insurance man. Second, we wanted a plan for our lives in order to take advantage of whatever quality time we had. Somewhere along the way we will probably discover things we overlooked, but that foundation has served us well so far. I thought we would have far less time for living than we have. I never expected that we would be getting along so well after eight years. That is largely because I didn’t understand how much pleasure we could have after Kate’s memory was almost gone. As we thought about the things we wanted to do, we gravitated to the things we already enjoyed. That included music, theater, travel, and time with family and friends. Each of these has played a significant role in our “therapy.” What is even better is that we are still able to enjoy most of the things that have led to a very happy marriage. Looking back, I am glad that we responded actively and not passively. At this moment in 2019, I realize how much life we can enjoy while “Living with Alzheimer’s.” I still don’t know how long our good times will last. I know that the time is diminishing rapidly now. We stopped all major travel in January 2016. We made what may have been our last trips to our children’s homes (Memphis and Lubbock) for Thanksgiving and Christmas. Movies are almost a thing of the past. I sense that non-musical theater and opera are on the way out. Music and social occasions like dining out play an even larger role in our lives now, but Kate’s sleeping late has cut down on our morning social engagement at Panera and our afternoons at Barnes & Noble. I plan to continue our day trips to visit friends as long as we are able. I don’t see anything that would stop that right now. I can’t help feeling sad as I watch Kate change and imagine what lies ahead. I also recognize that our own experience with Alzheimer’s has been far better than that of most others. The past eight years are among the best of our marriage. I am grateful for that. I also feel a strong sense of determination to see that we make the best of the future no matter what it may bring. As a caregiver, I often hear expressions of concern about how I am getting along as well as compliments about my care for Kate. I appreciate that, but I sometimes feel Kate deserves more attention than I do. As I attempt to describe in this blog, this is a journey we are making together just as we have dealt with other challenges during our marriage. Today is her 78th birthday, and I am thinking about the way she has approached her diagnosis. She accepted it with courage and a positive outlook. I would have been more public if I had been in her shoes, but I respect her decision to be more private. She has never wanted people to feel sorry for her or to treat her any differently than they had done before receiving her diagnosis. To this day, she has told only one person. That’s Ellen Seacrest, her closest friend whom we visited in Nashville on Saturday. I honored her choice for several years, but we were making changes in our lives that I ultimately felt required an explanation to our family and friends. Consistent with her desire for privacy, she wanted to maintain her independence. I have tried to respect that but confess that I’ve not always succeeded. Over time, she has grown much more dependent. Even now, she prefers to do things on her own, but Alzheimer’s has forced her to acknowledge that she needs help. She has always been even-tempered. Alzheimer’s has made that more difficult for her. Overall, however, she has been very easy to care for. That is especially true because she is so generous in her expressions of appreciation. It is much easier to care for someone who is grateful. On those occasions when she has been abrupt with me, she has often apologized. She is genuinely kind-hearted. That’s not just the way she treats me. It’s the way she responds to strangers we meet in our day-to-day experiences. I can’t tell you the number of times she has thanked bus boys and other cleaning staff in the restaurants we visit. She also gives warm greetings to other customers. That warmth also extends to her sitters whose names she still can’t remember. Kate’s sense of gratitude goes far beyond the things that I may do for her. She often talks about how fortunate she has been in her personal life and we have been in our married life. I agree strongly with both of these things, but I am inspired by her recognition of how well life has gone for her. She never mentions the dramatic impact that Alzheimer’s has made on her life. By now, of course, she no longer remembers that she has Alzheimer’s. She has experienced frustration, but her diagnosis has never lessened her feelings of gratitude. She never feels sorry for herself. She views health issues and death as natural events to be dealt with to the best of her ability. It may surprise some people to know that we have found the past eight years since her diagnosis to be among the most fulfilling of our 55-year marriage. Kate and I share a number of things in common. That’s one of the reasons we have gotten along so well pre- and post-Alzheimer’s. Among those things we have in common is a sense of gratitude. Above all, I am grateful we met and quickly sensed a connection that would be permanent. So on this birthday I want to go on record by saying how much I admire her, especially for the way in which she has handled “Living with Alzheimer’s.” In my book she’s a champ.